I was smack in the middle of wrapping up loose ends with work, deciding on what to pack and squeezing in a few last-minute doctor appointments when it hit me. "I need a Rick Steves," I thought. Two minutes on Amazon and it was done. Rick Steve's "Germany" would be delivered the day before I was flying out. But it wasn't until a week later, sitting in a café in Wiesbaden, that I actually opened the book. Oddly, Wiesbaden wasn't listed in the Contents. I checked the Index, flipped to page #536 and read: "Mainz, Wiesbaden and Rudesheim: These towns are all too big or too famous. They're not worth your time. Mainz's Gutenberg Museum is also a disappointment." Mainz and Wiesbaden. Wiesbaden and Mainz. Not that the two cities appreciate being linked. They have rivalries that span centuries (forget the North and the South, these guys go back to the Romans and then Napoleon.) This column is all about Wiesbaden. In a few days comes Mainz. And then Sauna 101, a primer on "bad" protocol. Wiesbaden is the "new kid on the block." While the Romans "took the waters" of the natural hot mineral springs (26 in all) that still spill, if not erupt, into the city, and a noted family built their residence here along the Rhine in 1774 (the Nassau-Usingen family built Schloss Biebrich, a Baroque palace/residence with fabulous grounds), nothing much happened until the 19th century. 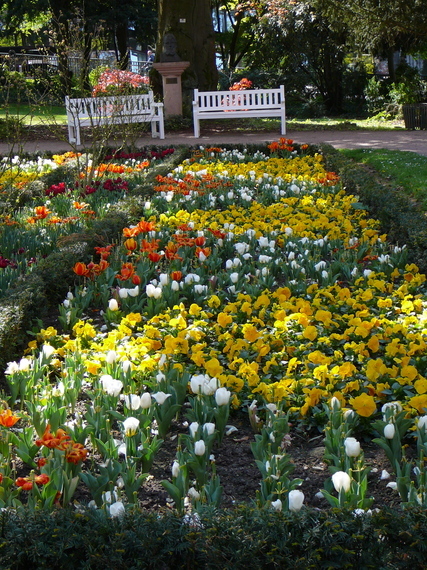 Wiesbaden was planned, along the same lines as Baden-Baden, to be a spa city of leisure and culture, for vacation and retirement, as well as a destination for medical treatment and healing. So, while the Altes Rathaus (old town hall) dates from 1610, most of the city was built up in the 1800s. 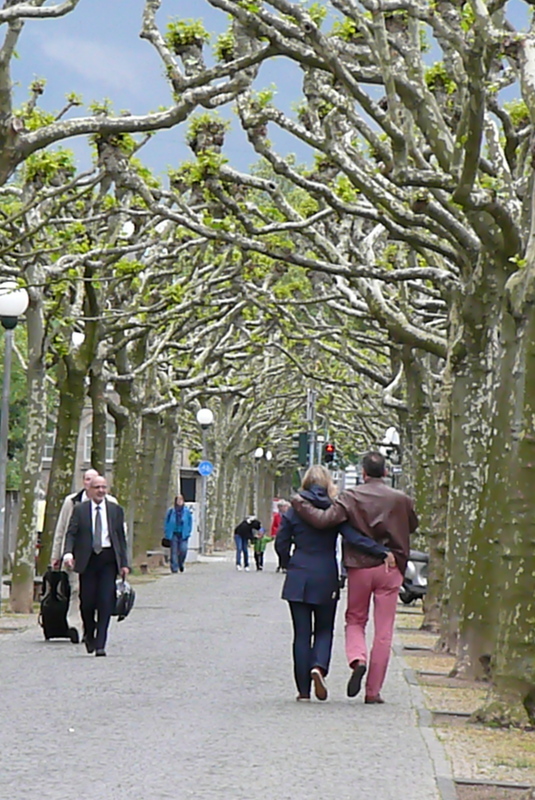 There are wide tree-lined promenades. The impressive Hessisches Staatstheater (state theatre) was completed in 1894 for Kaiser Wilhelm II. Behind the Kurhaus is a band-shell, a small lake with canoes and pedal-boats, and an English-style park, landscaped with magnolias, azaleas and rhododendrons, that extends for a few kilometers. Wiesbaden is green, in its parks and forest and attitude. In 1900, there were over 300 boarding houses and hotels in Wiesbaden. The Kurhaus library had over 100 newspapers and magazines, in many languages, for the international tourists. It was an essential stay on any tour of the Continent... and people often stayed for months. To get a feel for the city, I suggest visiting the Farmer's Market, held every Wednesday and Saturday in the Dern'sches Gelande (Market Place), and then take in the free 11:30 a.m. organ recital at the Gothic Revival Market Church (completed 1862). What I enjoy about the recitals is that they are not just for tourists --- most of the audience is local, baskets of lettuce and asparagus and cheese propped next to them in the pew. This is a part of their weekend routine... some fruit, cheese, sausage, vegetables, Bach and Durufle. While 'newer,' many Wiesbaden buildings have history and stories. 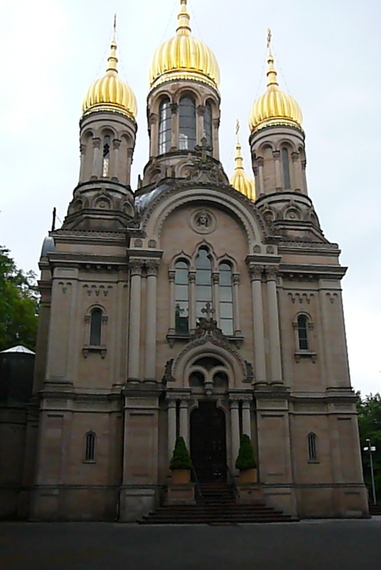 The Russian Orthodox Church, with its five ornate golden domes, was built (1847-1855) as a tomb and shrine for the Grand Duchess Elizabeth Michailovna. The story is that her arranged marriage to Duke Adolf of Nassau became true love. When she died at age 19 in childbirth, the Duke mourned deeply, and her father (Michael Romanov, younger brother of Tsar Alexander and Tsar Nicholas I), refused the return of her dowry and instead said to use the money to build a church. There is a Russian cemetery adjacent (the largest in Europe outside Russia --- ask for the key at the church to unlock the gate.) I was told that all Russian churches are built on Russian soil (they brought the soil over) and that the main entrance to the church, which looks over all of Wiesbaden below and was used for nobility, has been closed since the Czar last visited in 1907 and will remain closed until a Czar comes again. It is situated such that, in the evening light, it is magically luminous. You can take the Nerobergbahn (like a funicular, only water driven) to the top of Neroberg Mountain, then walk a short path down to the Opelbad (outdoor swimming pool) perched above the city. I enjoy sitting on the terrace of the adjacent restaurant, which, despite the panoramic views, is no more expensive than any place in town. From the Opelbad, you can walk another path down to the Russian Church... and then continue to the city below. Neroberg Mountain is forest, with hiking trails, right in the city. And then there is the Roman-Pompeian Villa Clementine (now called the Literature House), completed in 1882, that was the setting for the filming of Mann's "Buddenbrooks." The city now owns it, as a quiet retreat for writers and artists, with a schedule of poetry readings, etc. Very informal, many tables, lounge chairs, shelves of free books, free Wi-Fi, café , two balconies, across the park from the Hessisches Staatstheater. It's a welcoming place for visitors to settle the mind. Villa Sohnlein (Small White House) was built by a champagne magnate for his American wife to imitate the original in Washington, D.C. To stroll many of the older neighborhoods of Wiesbaden is to be immersed in the elegance of an era. I've heard that Wiesbaden was one of the first cities where investors built homes, decorated them, and then sold them as completed projects, move-in ready. The city was a magnet for wealth. All of this elegance exists because the Allies did not bomb Wiesbaden as they bombed other cities, like Mainz, during World War II. There are conflicting explanations: 1) Because Wiesbaden had banned factories and 'dirty' industry, there was nothing worth wasting precious bombs on; 2) The Allies already knew where they wanted to settle in and 'occupy' after the war... in the lovely villas of Wiesbaden. And they did. The U.S. military still has a lively presence in Wiesbaden and environs. Wiesbaden cannot possibly compete with Munich or Berlin or Frankfurt or Cologne or Stuttgart. But it is cozier, more easily navigated, than the big cities. You can get off the plane in Frankfurt and grab a train from the airport direct into Wiesbaden (about 20-30 minutes.) For great museums, just hop the train back into Frankfurt. But Wiesbaden is a lovely place to stay, to use as a base-camp. It's safe, with a more relaxed pace. And you can easily go to Mainz, or any of the villages in the Rheingau, or up to Cologne, or, as I did a few weeks ago, take a train to Paris for the weekend (only four hours from Frankfurt.) Also just four hours to Amsterdam. The way to plan a visit to Wiesbaden is to start with what you enjoy. This weekend, for example, is the PfingstTurnier Wiesbaden (the 77th International Horse Show at Whitsun... a 'Wimbledon' of horse show jumping and dressage.) Last weekend was Kranzplatz Fest --- five free nights of rotating bands, of all sorts, in two bandstands, with beer and wine and healthy and hearty food vendors and craft stalls. There is a brochure listing the many Wine Fests in the region. Wiesbaden's 10-day Rheingauer Weinwoche, August 8th-17th this year, sprawls through old town Wiesbaden, also with daily music and bands and entertainment (also free.) Or come for Christmas Markets. Maifestspeiele is a month of entertainment overload (57 events, 31 productions from 12 countries -- opera, dance, drama, music) and it can be traced back to when the emperor would visit (then it was Kaiserhofspiele) every year, expecting culture and theater almost every night. But, really, every week in Wiesbaden is a culture fest. This very minute I am torn between full-scale productions of Evita on Sunday night, Verdi's Faust on Monday or (because I think it would be a hoot to hear all the songs in German and I don't need to worry about tracking plot) My Fair Lady on Tuesday. And tickets (granted, they are nose-bleed, but in the most incredible theater) are under 10 euro. I think Verdi may win. These are just a few of the many options in this gracious city.